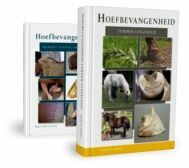 If you think taking your horse barefoot is ‘alternative’ then it might surprise you to hear that almost all disadvantages of horse shoes listed underneath have been copied directly from books written by certified traditional and well known farriers. When horses are not moving fully comfortable farriers and vets habitually advise to have them shod. When the horse is usable again everyone is happy and there seems to be no need to search for the cause or a solution for the problem. But a shod horse being usable doesn’t necessarily mean that the horse is sound or that his feet are healthy. In fact, if shoes were beneficial for horses you could simply remove them and horses would walk of sound and happy. We all know that this is rarely the case. Most horses take quite some time to transition to barefoot. Shoes do not solve problems but mask them. Horses might not feel their discomfort anymore but the cause of this discomfort has not been resolved. Making an animal feel better seems a positive and humane thing to do, but for not many other health issues we would put animals on permanent pain remedy without looking for a proper diagnosis or treatment of the cause. 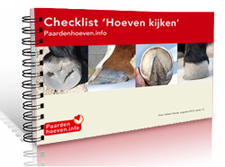 When hooves are weak or sick or the horse is unable to walk comfortably over certain types of footing, other types of hoof protection can be used during the time it takes for the hooves to adjust or recover. 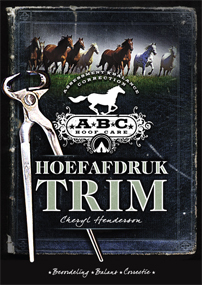 Although hoof boots and glue-ons also have disadvantages they are generally less damaging than nailed on metal shoes. The digital cushion and hoof cartilages are the flexible parts in the back half of the foot that provide natural shock absorption to the leg. On Youtube you can find several slow motion videos that compare the shock absorbing qualities of shod and unshod hooves. Shoes decrease the natural flexibility of the hoof which is needed for optimal hoof mechanism. Hooves and lower legs of shod horses are normally colder and more prone to injury because of lack of circulation. Also horn quality and growth speed can be affected by the lack of nutrients and oxygen in the tissues. The two cartilages in the hoof enable the two sides of the hoof to move up and down independently. On irregular or uneven footing this lateral suspension protects the hinge joints in the leg from being loaded sideways. By attaching inflexible shoes to the hoof, the individual cartilages cannot perform their task because they are basically attached to one another. This increases the risk of injury, inflammation and wear of the joints. Shoes lift the hoof off the ground so the back of the frog and circumference of the sole have no longer ground contact and lose their part in carrying the load. The weight of the shod horse is entirely carried by the hoof wall. Peripherally loaded hooves will deform easier and the sensitive lamellae will suffer from it. Bars will get trapped underneath the shoe and bend in a undesirable position. Shod horses have less grip because metal is slippery compared to hoof horn. If you have the chance to compare the sure footedness of shod horses and unshod horse on different terrain you will find out barefoot horses have much more grip on snow, ice, tarmac and even wet grass. Barefoot horses have better tactile sense and proprioception so they are able to choose more carefully where to place their feet, which also prevents injuries. 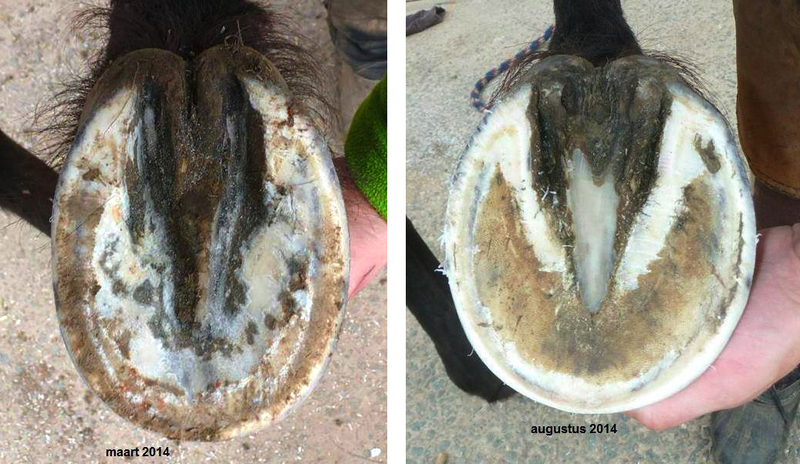 Shod hooves are able to create more damage than bare feet. 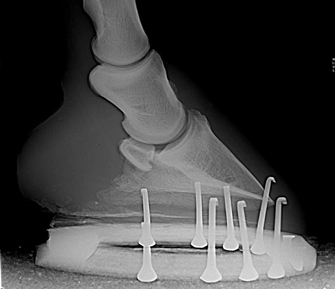 Being kicked by a bare foot horse would be bad enough, but shod horse that strike themselves or kick others can create an awful lot of damage. Nail holes dry out the horn, weaken the wall and provide an entrance for fungi and bacteria. Horn is very well insulating material. 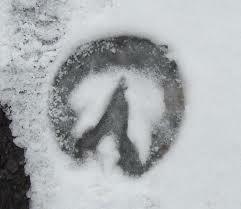 Via the metal nails the environmental temperature penetrates deep into the foot. On thermographic images this can be clearly seen. Metal shoes add a considerable weight to the leg of the horse. The heavier the shoe, the more biomechanics are influenced negatively. 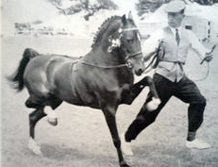 In some disciplines exaggerated gaits are appreciated, however it is easy to understand that the artificial change of movement will always have a negative impact on the tissues over time. Healthy hooves grow approximately a centimetre per month. Shod horses do not wear their hooves naturally at all and are often not maintained regularly enough. 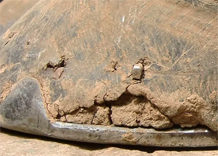 In between each shoeing the horse will experience quite a change in stance and the hooves tend to slowly but surely deform over time, leading to problems like contraction and underrun heels. Front feet that are naturally round will become more elongated over time. One of the many benefits of barefoot horses is that they can be maintained whenever necessary without needing to remove and reattach shoes or worrying about the nail holes being too close together. A research of the Zurich University shows that metal shoes generate a vibration frequency of 800 HZ, a frequency that is harmful to live tissue and can cause arthritis. When I was a kid and I heard shod horses passing by I really needed to run out and have a look. The sound of shoes I associated with something great: Horses! Now I am not used to this sound anymore and when I do hear it I find it quite unpleasant. It’s probably impossible to find out what the opinion is of horses themselves, but it’s easy to imagine that they, as a prey animal, would prefer to be able to pass by in a less notable way. There are many owners that can affirm that their nervous, spooky horses became more relaxed and calmer after being taken barefoot.